A critical seven-month period in one of America’s most transformational presidencies is revealed in the latest installment in the Correspondence of James K. Polk series. 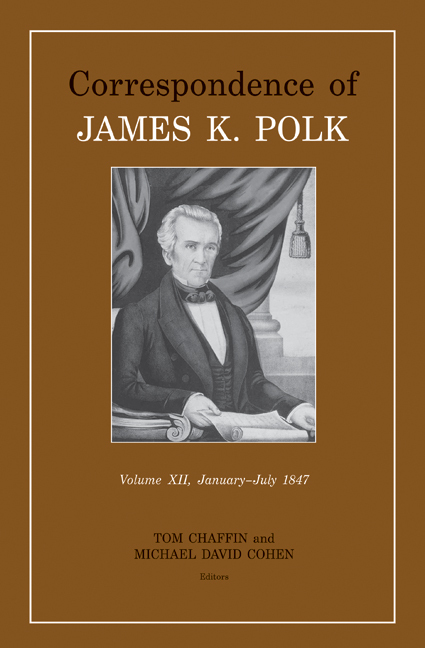 Volume 12 of the Polk series, encompassing letters from January to July 1847, was edited by Tom Chaffin and Michael David Cohen of UT’s history department and was published in October by UT Press. Polk, a former Tennessee governor and congressman, was the eleventh US president (1845 to 49). Many of the new volume’s letters chronicle his prosecution of the Mexican War. This war, along with Polk’s 1846 acquisition of the Pacific Northwest, increased the size of the United States by one-third. Housed in the History Department, The Correspondence of James K. Polk project devotes itself to publishing Polk’s letters. Among the 344 letters published in Volume 12, many document the Mexican War. Other letters chronicle foreign policy issues, such as the administration’s concern with European affairs. Letters published in this and other volumes deal with Polk’s purchases and sales of slaves. “Unto themselves these letters tend to yield few details regarding the identities of the slaves,” wrote Chaffin, research professor of history and director and editor of the project, in the volume’s introduction. Chaffin and Cohen, research assistant professor of history, wanted to delve deeper into this side of Polk’s life. Toward that end, they located and acquired photocopies of primary source documents—sales contracts, probate court records, and the like—related to Polk’s business affairs. Notes in the latest volume, drawing on those documents, provide essential biographical information, including birth and death years, for many of the slaves. “Through such notes, we hope to enhance the value of this series to social historians and to historians of the African-American experience,” the volume’s introduction notes. Two more volumes are planned to complete the Polk series. A search for more Polk letters, through the Internet and contacts with archivists and dealers, has uncovered materials not located during the project’s original search, begun in the late 1950s. Chaffin, a 2012 Fulbright Fellow, is author, most recently, of Giant’s Causeway: Frederick Douglass’s Irish Odyssey and the Making of an American Visionary, to be published in October 2014.